In 2016 our little food world was abuzz with talk about a new Japanese Bakery which had just opened in Beaverton – Oyatsupan. I made the trip out and wasn’t particularly impressed. Fast forward to 2019 when I was helping a friend move a few blocks away and I decided to give it another try. I’m glad I did; all of the issues from my first visit have been remedied. 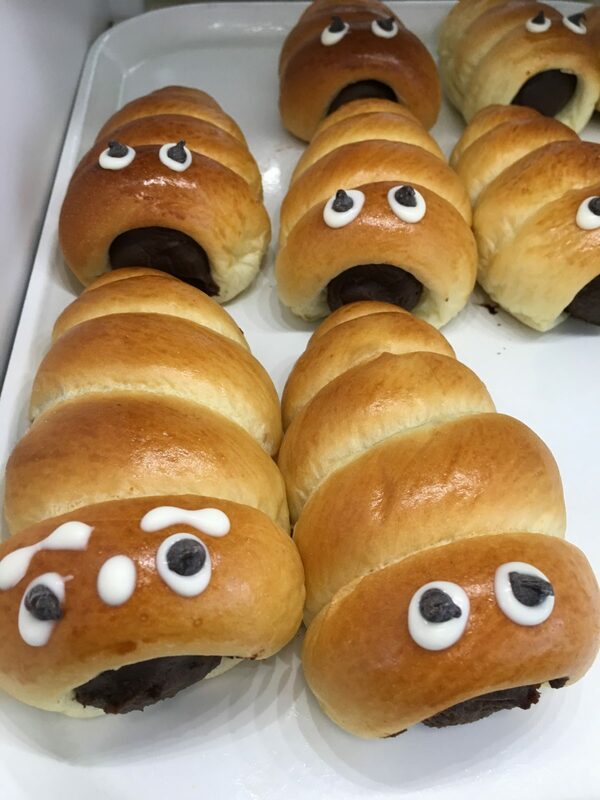 The Oyatsupan space is bright and airy, one wall lined with bins of pastries that reminds me of a 50’s automat (yes, I’m old enough to remember) – wander down the row with a pair of tongs and a tray, oohing and aahing over the cute pastries. Service is great, and the whole place has a friendly, family atmosphere. A musician is sometimes playing in the corner adding to the ambiance. Much of the pastry is based on “oyatsu pan” or snack bread – soft, pillowy, silky loaves that are baked in a pan. It’s fun to wander down the row of pastries; if you want to take photos for your Instagram feed, this is the place. Each bin has a little sign with a description, the source of some ingredients – azuki bean comes from Imuraya in Irvine CA., cheese from Tillamook, plus a list of common allergens – milk, egg, tree nuts, peanuts, shellfish, soy, wheat, etc. Oyatsupan has both sweet and savory pastries with a small selection of sandwiches. 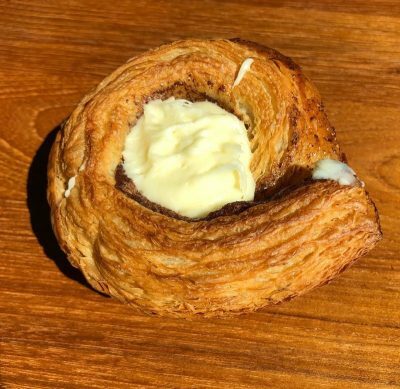 You’ll find a wide variety of croissants, puff pastry, red bean rolls, cinnamon rolls, matcha pan, bananas and caramel over puff pastry and more, all made from scratch. Everything is better than the norm – the red bean is leagues above most, moist and flavorful, vanilla cream actually has vanilla bean, the chocolate tastes like a quality product and the puff pastry flakes into a million crunchy shards as you bite down. There is also a refrigerated section for more perishable items such as a light cheesecake, ham sandwiches and a tonkatsu slider which was excellent. On one visit I kept to savory choices, trying the Oyatsupan dog, which was interesting though not really my thing – made from a pastry bun with a Japanese smoky sausage and a glaze of stone-ground mustard on a butter roll. I felt better about the EPI, a baguette with bacon and Tillamook cheese and mayonnaise inside the bread. The curry donut didn’t thrill me either, but I am in the minority; many people wax poetically about it. However, I loved the jalapeño bread, a large flat loaf studded with just enough chili to give it a spicy kick. Prices are a bit higher than you may be used to; about $2.50-$3.50 and up per item, but the food is worth it. They have a full coffee bar though I wasn’t particularly impressed by the espresso drinks. A similar type of business, Tous les Jours Asian bakery just opened in Beaverton town square – near Penzeys Spices and Fred Meyer. I’ll have a review for you soon, but in the meantime, I’ll give you a hint – go to Oyatsupan. 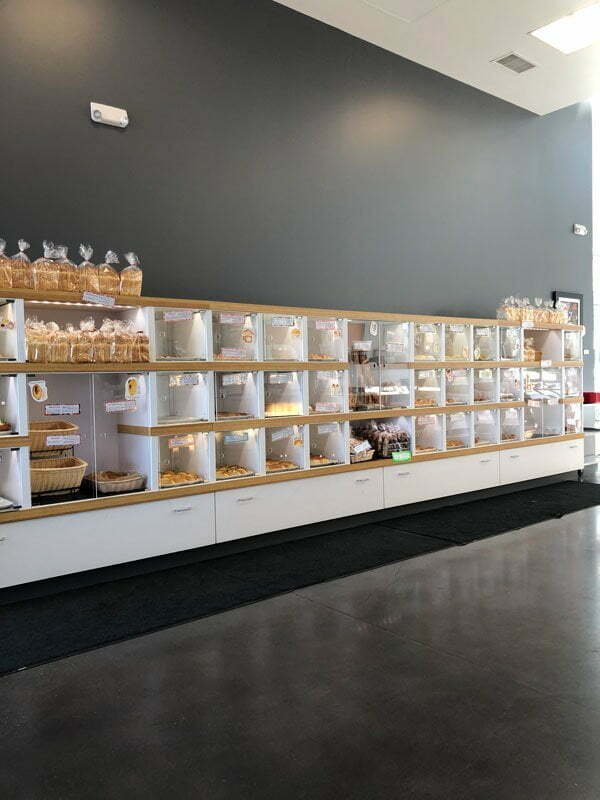 Some of their goodies are available at Giraffe Goods in SE Portland and Uwajimaya, but if you want the full experience and a wide selection of choices the bakery is worth the drive to Beaverton. Your kids will love it and you’ll love it even more. Ratings over five visits: Consistency 100%. Quality A. Atmosphere: A. 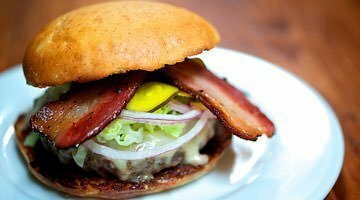 Category: Portland Food and Restaurant News and Discussion. Related posts about Oyatsupan Bakery. I picked up four things, two savory, two sweet, and we loved every single bite! Cute place, if a little sterile, and the girl behind the counter seemed so happy to be there–always a good sign! Prices ARE high, you’re right! But, I don’t eat pastries very often, and I would much rather pay those prices for that quality and flavor any time I have a hankerin’!! Thanks for the tip!